On 4th April 2019, women across all ages, religions and social classes came together to voice their collective dissent against the current government and their propagation of a politics of violence and hatred. The march began at Mandi House and was carried on till Jantar Mantar. The march was a part of a larger movement in India titled ‘Women March for Change’. Prominent student groups present in the march were members of Pinjra Tod, Women Development Cells of Lady Shri Ram College, Indraprastha College and Miranda House. When asked about their personal motivations for attending the march, students spoke about a range of issues referring to the political climate of the day. “There is a constant invisibalization of women’s struggles, politicians include us in their policies, Rahul Gandhi says the Womens’ Reservation Bill will be passed, but it only a tokenistic gesture. 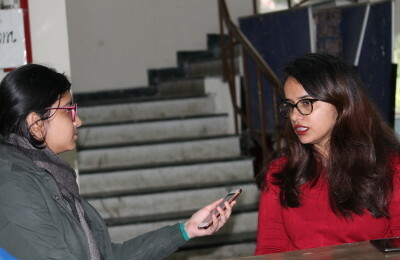 It’s high time for us to claim public spaces,” said Deeksha, a second-year student from Delhi College of Arts and Commerce. Some also spoke of their personal struggles and sought to join the fight against the patriarchal structure, “We don’t have any freedom, even today my father tells me what not to wear, where to not go and so on. We need to get over this mindset,” said a student from Lady Shri Ram College. Students also expressed concerns about the representation of women in politics, both in policy decisions and at important positions in the country. A student pointed out that even with three female cabinet ministers, important press conferences and announcements are always done by the male members of the cabinet citing the example of Shri. Arun Jaitley addressing the crowd after Balakot strike. “It’s disheartening to see women in politics only being referred to as somebody’s amma (mother), beti (daughter) or behen (sister). In my constituency, a female candidate was contesting for the assembly seat but the posters had pictures of her husband,” another complained. The march and in extension, the movement is being carried out with the hope of carving out a distinct and powerful voice in the political scenario. “I would like to be heard. This is more of a pre-election forum for women to voice their struggles and to make it known to people that they are a force in the country “ said a student when asked what she hoped would be the outcome of the march. ‘Save our Constitution’, was what the biggest banner in the march said and it was reflective of the palpable fear that all the participants held. The actions of the current government has attacked the core values of our constitution that it had affected every single community that lived in the country. Feature Image Credits: Pragati Thapa for DU Beat.